Everyone has a groundwater story. 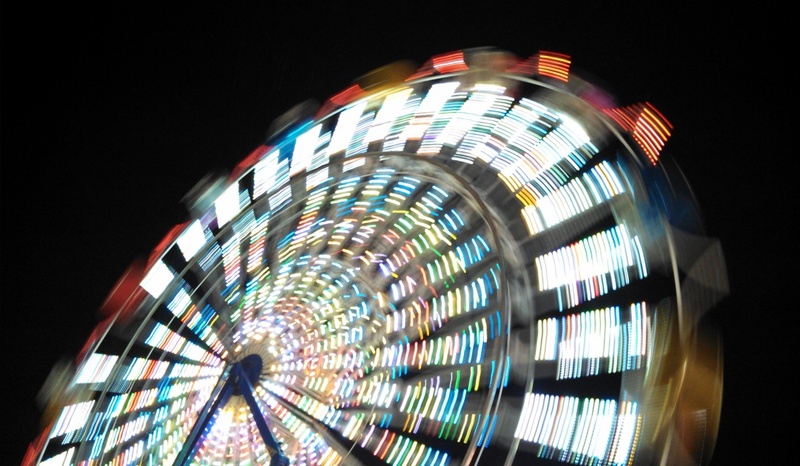 All’s a whirl at the Mid-State Fair in Paso Robles, California. So it is with the area’s groundwater problems. Click image to enlarge. PASO ROBLES, California — A number of paintings hang behind Dennis Curry, who is sitting in a folding chair, but the image of pale green hills brushed by a golden-hour sun stands out. Nostalgic Californians will debate which era constitutes the good times, but future generations almost certainly will not nominate the year 2014. A nasty drought stifles the nation’s most populous state. In farm towns like Paso Robles, found halfway between San Francisco and Los Angeles, the gloom is especially pervasive. Now in its third year, the drought is a slow-boiling crisis. New bubbles surface after each dry month, bubbles that expose deep-rooted inadequacies in the stewardship of California’s water resources. But tonight, a Tuesday evening in late July, the residents of this wine-country town in northern San Luis Obispo County are in a festive mood. Families with strollers, gaggles of teenagers, and those ready for a party all crowd down 21st Street. The Mid-State Fair (“The Biggest Little Fair Anywhere!”) is in town. Believing that county fairs are one of the great mixing bowls of the American democracy – campaigning politicians, beauty queens, farm kids, pop music stars of yesteryear, all getting dust on their shoes – and holding a longstanding affinity for the carnival idea, I took my questions about the drought to the Paso Robles public square. Droughts, like an unhappy Tolstoy family, are destructive in their own way. Local economic conditions, available water sources, and the rules for using water determine how acute the pain will be. Jobs tied to land and water suffer the worst. 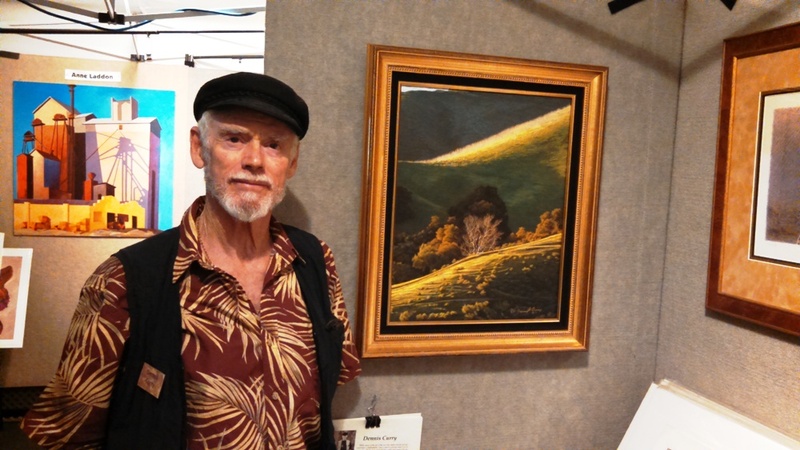 Dennis Curry, a painter, has lived in the Paso Robles area for 30 years. “We live in dynamic times,” he says. Click image to enlarge. Two men at the livestock barn, for example, worry about the area’s cattle industry. Last year the youngsters who show cattle at the fair as they gain experience with animal husbandry, brought more than 100 steer to be sold at auction. This year, no more than 80 animals are in the pens, reckon the two dads, who did not want their names printed. The rising cost of hay – which can run $US 50 per day for a dozen head of cattle – has proved prohibitively expensive for the young operators. The area’s recreation economy has also been hit. Chuck Woodward, a park ranger for San Luis Obispo County, was manning a booth touting outdoors spots. He said that both boat ramps at Santa Margarita Lake, a popular site, are closed. The lake is just 29 percent full and is headed toward a record low, at the 10 percent threshold, if another dry winter comes. Revenue is down, he said: “It’s a little unnerving.” And for good reason. The next day neighboring Monterey County laid off 14 parks employees who worked at two lakes. But beyond all else, what the fairgoers mentioned most often was the county’s groundwater problem. The groundwater basin beneath Paso Robles is unregulated. State officials acknowledged in the 1970s that more water was being pumped out than filtered back in. Water levels bounced up and down, but signs indicate a deficit still exists. The difference now, says Christopher Alakel, water resources manager for Paso Robles, is that the wine grape industry is larger and the county is approving new residential subdivisions amid the fields. Agricultural wells are deep and large. Residential wells are smaller and shallower. Add the lack of rain to replenish the aquifer and you have the recipe for 2014: a spate of dry residential wells. Local officials, farmers, and residential well-owners are trying to settle on a plan for greater oversight of the water table, but a tentative agreement seems to have fallen through. Large farm landowners and citizens’ groups disagree on the basic rules to establish a new governing body – such as the composition of the board and how to divide the voting shares. The business of regulating water use is another matter altogether. In the interim, everyone has a well story. One of the men at the livestock barn said he just deepened his well from 146 meters (480 feet) to 213 meters (700 feet). Woodward said the parks department lost one of its wells near the lake, which was unusual. Curry, the artist, said his neighbor wanted to drill a new well down to 183 meters (600 feet). The drilling company said anything shallower than 229 meters (750 feet) would be a waste of time and money. For now, Curry’s well is still producing, but he is concerned about another dry year. “If it goes dry, I’m an artist. I can’t afford the $US30,000,” he said, that being the amount of cash necessary to drill a deep well.